One of the biggest issues in vitro fertilization (IVF) is knowing which embryos have the best chance of implantation and normal development during pregnancy. 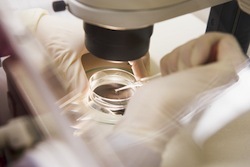 The standard technique for selecting embryos for transfer is by analyzing the embryos under a microscope to determine which ones look most viable. This approach, however, has serious drawbacks. Just because an embryo looks good under a microscope doesn't mean it is a healthy candidate for transfer. The microscope cannot tell if an embryo is missing a chromosome or has an extra one. Embryos with chromosomal abnormalities have a much lower chance of implanting in the uterus and developing to term. However, when these embryos do result in live births, the children inherit genetic disabilities such as Down's Syndrome or Turner's Syndrome. With the high cost of IVF, many couples only have the opportunity for one chance; choosing the embryos most likely to implant on the first round is key to the technique's success. Recently, fertility researchers in the UK have developed a new embryo monitoring technique that increases the odds of successful implantation and healthy babies by 56 percent. It is proving so successful at selecting embryos that will actually implant and develop that many fertility researchers are sure this new technique will become standard in just a few years. The technique for choosing the best embryos for transfer is astonishingly simple and builds upon what is already being done. Instead of checking on embryos 5 to 6 times a day to monitor their development after fertilization but before transfer to the uterus, the new technique uses time-lapse photography to take up to 5,000 photos of the developing embryos during this time. Any embryos that are developing more slowly than normal are discarded as candidates for transfer as their slow development is the best indication of chromosome abnormalities (aside from actual chromosome testing). The time-lapse photography monitoring method is much less expensive than testing embryo cells for abnormal chromosomes and it has nearly as high of an accuracy rate. This is truly a revolutionary procedure that will result in many more successful IVF cycles and live births of healthy children.